This entry was posted in Audio/Visual Effects, RMVXA Scripts. And yes, 8 faces in a faceset is the maximum, but you can make another faceset to have more. In the script settings there is a switch that disables it. I believe you are turning it on somewhere in your game. You can change what switch the script uses. I’ve got a request / question of some sort. Would it be possible to animate the busts? If so, then I hope that this would be a good reference. It would be possible, yes but I not doing many requests at the moment, sorry. Why not just use Modern Algebra’s script? I could try, still not sure how I’m going to turn busts into animation, facesets are built in though, but thank you for replying anyways. If it’s not too much trouble, could I have some help? Having one character say multiple text boxes in a row means they fade/slide in again (in battle, anyway, haven’t tested outside of it), and it’s a little jarring. Hmm interesting, the battle messages close after each one, which is why this happens. It doesn’t happen on map. Unfortunately I don’t have time to look into a solution right now, though. That’s fine! I’m in no rush, but if you could find a solution/hint, that’d be great! You could always use ‘show picture’ for in battles. I’m having the bust covering the text box right now and the text automatically moves over when the bust is on the left side, but continues under the bust if its on the right side? am I just doing something wrong here? ok that’s what I figured. just checking because is seems to do it from the left side. The left side is just indented. It doesn’t need to wrap on the left that’s the normal position for text. The right side needs to wrap in order to go to the next line, which this script doesn’t do and isn’t in rpgmaker by default. Your script says that there is a demo to download if help is needed on how to use the script. Where can I find the demo? I would love to use this. The link to the demo is above the script you copied. I tried a lot of things but it just doesn’t work for me. I did. It still doesn’t work. Then, can you explain how it works a little bit more? I’m a little confused with the faceset and bust things. Also, what does the value of the DISABLE_SWITCH mean? Hi Galv – great script. I’m using the heck out of it. I have encountered a bit of odd behavior though, and I’m wondering if you think it can be fixed. Between no face and face 3, face 1 re-appears and slides out. This only happens when the message boxes have different settings. It’s like the bitmap isn’t properly cleared at the end of the message. When I turn off the swipe transition, face 1 re-appears and then disappears before face 3 shows up. Ok. I’ll give that a try. Hey Galv,, great script there, but could you add some setting that could change bust_Y_over in-game with switch? Hey, I asked the question about the slide function a little bit ago. Just wanted to clarify that I’m not asking you to do any additional work. If there is a simple way to control what slides then cool. If not thats cool too. I have been using this script for long and i want to set compatibility tutorials with you and yanfly on my blog. Can i do so? Just a quick question. I’m using your script, and it works perfectly, so thanks so much for sharing it! However, I recently added a light steaming effect to some of my maps, in the event/show picture form, and when on a map that has this light effect event, the busts no longer show up. It defaults back to the faceset. Is this normal, in that I can’t show 2 pictures at once, technically? Both scripts probably use a ‘switch’ which you set in the script settings. I am guessing you have the same switch set for both causing one to turn off. Ah! I feel like such an idiot! That was exactly it. Is there any way to put 2 busts at once in a conversation? Not by using this script. What if I use your Double Message script? Sorry, nope – unrelated scripts. That script doesn’t work fully and isn’t very good anyway. If it doesn’t say it in the script instructions then you can’t do it. I use time and other foot book run tu how to do? I’m sorry I don’t know what you are asking. I’m so sorry.I’m Chinese,and I can’t speak English well,I think I want to tell you: it conflicts with my other scripts.I don’t know can you see these word,I’m so sorry. I think I speak I‘m a Chinese before. I found an interesting (not sure if this a bug or not but i routed the problem on the next project I’m working on). If the switch is set to OFF for busts (using just a portrait) auto run events that contain “set move route” for the player or other characters will not execute. The game doesn’t lock up it continues events as is (example if you put Move U,U,U,U,U, Balloon, text. The event will run but the player will not move like there’s unmovable tile there even though there is not, however Balloon on the player etc or other npcs that’s associated with the auto run event will still continue to execute.) I found out that i had to turn the switch back to ON after a regular face portrait is displayed and the event would run as normal. The introduction to my next project has a lot of move routes for the auto event the this came up the moment I added the switch OFF event in there. Not sure if this is a bug or not or could be another script in my project interfering with it but I figure I’d point it out. The cause didn’t happen until I added this script. Great a script as long as the switch is turned off after regular face is displayed. It sounds like another script you have uses the same switch to disable movement or something else. It has nothing to do with this script. Check script settings and make sure they are all using different switches. I am having a bit of trouble with this script, i am not sure if i missed something basic or not. When i switch the busts so they appear on the right side of the screen (when looking at game). Text is going behind the character bust, not automatically moving it to the next line. It seems the script is not accounting for the bust over the message box. I thought these being the same would correct this. i am using yam message script and ma ats formatting also, however i do not think there should be any issues here. 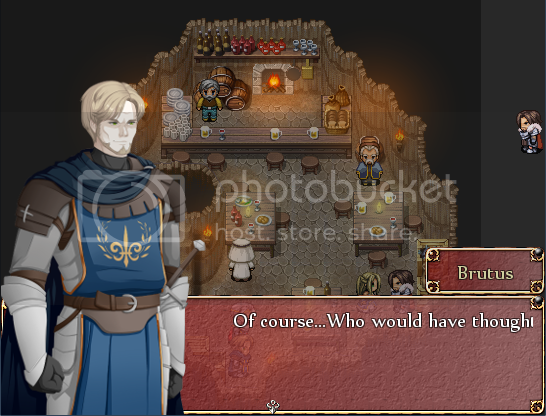 By default rpgmaker doesn’t have text wrapping. If the bust is on the right, you need to make a new line manually in the text box. The script wasn’t written with other scripts that do text wrapping in mind. So i just have to account for the space of the image & turn ma ats off and do it manually…thank YOU! Hey Galv, I was wondering if it was possible to manually change the y-value of the bust position. For example: Normally the two options are on top of the text box, or at the bottom of the screen; is it possible to put the bust in a y position between the two? I don’t have time to modify the script to do that for you, but you could always just add blank space at the bottom of your graphics to raise them a little. Galv sorry to bother you again, is there any way to turn off the text indenting when the bust is over the message box.? I have run into a problem where it indents to far and just looks silly. I have been playing with the script but can no for the life of me find a solution. Here is an image of what is happening. I would be willing to pay if script alteration is needed. actually fixed it was not aware negatives could be used! It should only indent as much as the graphic file is wide. 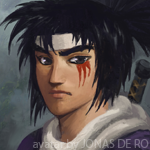 Do you have blank space to the right of the portrait in the png? Hello Galv, I have a problem..
Scrip’Busts’ line 137: NoMethosError occurred. I don’t know why it says that and when i look at the line 137 i can’t see anything wrong :S can you help? firstly, I want to say that this is an amazing script and it’s exactly what I needed in my game. Thank you for making it! However, I have a small issue – when I show choices to a player, they appear -under- the bust, not -over- it. Is there a way to fix it? I tried changing the z value to 0, -1, and even -100 but nothing worked, the busts keep appearing over choice window. I’m running the bust_mirror(true) command as well as using Yanfly’s Ace Message System (his script is higher then yours in the materials secton). Btw: the busts work fine with Yanfly’s name window and regular message screens. Only the choices themselves are problematic. Removing Yanfly’s scripts entirely doesn’t fix the problem either. If you go that low the busts won’t appear at all. Do the busts have to have certain dimensions? If so what are they? Hello Galv! This ia a very useful script, thank you for sharing :) I have a small problem. When I try to use the script call bust_mirror(true) to make busts appear on the right they still appear on the left. I’m sure I’ve done everything right, so what could be the problem? I realize no one has commented on this in a while, but I am running into an issue where the message busts only show up in the initial conversation. Once I take control of my character for the first time, and leave the initial place where you start out in, I cannot get the message busts to appear correctly for some reason. Any ideas? It is 1 by default. If you turn ON this switch number, the busts will no longer work. I believe you are turning ON the switch that is set here during your game.